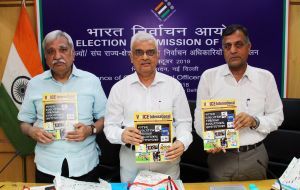 The Chief Election Commissioner of India Mr. O P Rawat, Election Commissioners Mr. Sunil Arora and Mr. Ashok Lavasa launched the special issue of the VoICE International(April-September 2018) magazine in Chief Electoral Officer’s Conference on October 4, 2018 at ECI Headquarters. The theme of the special issue (April – September 2018) of Volume II of the magazine is ‘Voter Education through Educational Institutions’. It primarily focuses on introducing greater electoral awareness and sensitivity among the future generation of voters and electoral participants; an issue that has great significance and relevance for investment in the future of Electoral Democracy. Apathy of the youth towards electoral participation and non-exercise of their franchise by a large proportion of them is a major concern in several democratic countries. In this respect, effective electoral literacy programmes through school and college level initiatives are an important means of encouraging participation of youth in the electoral process. Further, the outreach of electoral literacy initiatives can be increased manifold through the use of electronic, internet and social media. Most of the democracies across the world, conscious of the importance of such initiatives have taken significant steps towards introducing several initiatives toward their electoral literacy programmes using both formal and informal channels. This issue highlights such initiatives across the world. Apart from contributions on the core theme, the magazine also features other articles by member Election Management Bodies(EMBs) on other important and pertinent subjects. The e-book of the magazine is available at http://voicenet.in/. All the prior issues (e-book/ pdf) of VoICE International are available at http://voicenet.in/voiceinternational.htm. 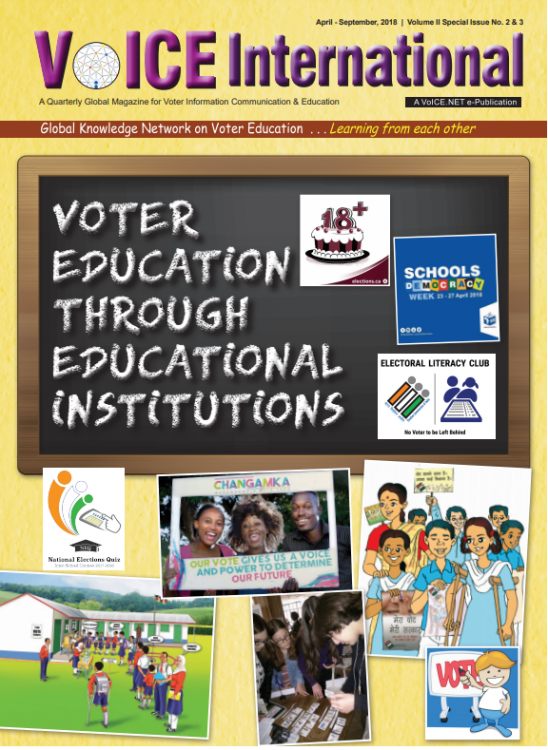 VoICE International is the quarterly e-publication on the VoICE.NET (Voter Information, Communication and Education Network) portal, a Global Knowledge Network for sharing knowledge, resources and expertise on Voter Education. VoICE.NET was launched on October 20, 2016 at the International Conference on Voter Education for Inclusive, Informed and Ethical Participation held at New Delhi. The Global Knowledge Network is a part of the New Delhi Declaration adopted at the Conference by the 25 Election Management Bodies and representatives from UNDP, International IDEA, IFES and Malaysian Commonwealth Studies Centre. At present, VoICE.NET has 27 members, which includes Election Management Bodies (EMBs) across the world and reputed international organizations. The portal is managed by Election Commission of India.